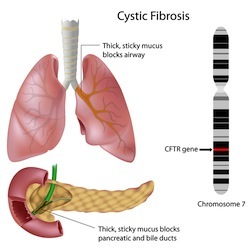 Cystic fibrosis is a progressive, degenerative disease present at birth. The disease progresses with age and can cause premature death due to complications. Researchers at the University of Auckland used information collected by the Australasian Cystic Fibrosis Bronchoalvelor Lavange trial to study prevalence of exacerbations from birth to age five in an attempt to report base expectations for lung structure, function and growth by age five. The results of this report can be used by future studies as an informational baseline. A total of 168 children, 88 boys and 80 girls, were followed for the study. More than 2,000 exacerbations were reported during the life of the study. While most issues were treated without hospitalization, more than 20% did require advanced medical attention. Children who received a 12-month course of antibiotics suffered exacerbations 26% less often than children who received no antibiotic treatment. Conclusion: Doctors can use exacerbations from birth to age five as a definitive marker for progressive cystic fibrosis. Effectiveness of treatment protocols can be gauged based on exacerbation frequency, number and other factors. Source: Byrnes CA, Vidmar S, Cheney JL, Carlin JB, Armstrong DS, Cooper PJ, Grimwood K, Moodie M, Robertson CF, Rosenfeld M, Tiddens HA, Wainwright CE; for the ACFBAL Study Investigators. Prospective evaluation of respiratory exacerbations in children with cystic fibrosis from newborn screening to 5 years of age. Thorax. 2013 Jan 23. doi: 10.1136/thoraxjnl-2012-202342.